AFirst Aid kitBoxis a collection of supplies and equipment that is used to givemedical treatment.There is a wide variation in the contents offirst aid kits boxbased on the knowledge and experience of those putting it together, the differing first aid requirements of the area where it may be used and variations in legislation or regulation in a given area. They are as per ANSI/ISEA Z308.1-2009 norms . Contents suitable for 25 people in series 2500 and 50 people in series 5000 Dimensions 28x20x11.5 cms for 2500 series 32x22x13 cms for 5000 series Block 90* opening facility Possible with series 5000 only. We are the most trusted entity in this domain, engaged in offering an extensive collection of Industrial First Aid Kit Medic Series that is provided in standard specifications. This medical series is manufactured by highly experienced professionals from quality examined raw materials and contemporary techniques. As the name suggests, the offered medic series is especially designed to be used in industries for treating minor injuries. 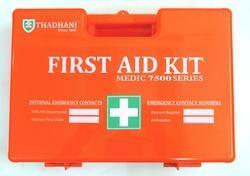 We also offer this medic series at thrifty prices to our clients. 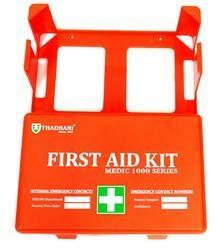 We are reputed enterprises in this industry, offering a wide gamut of First Aid Kit, available in various specifications. These products are manufactured using optimum grade raw material and sophisticated technology in tandem with international standards at the vendor's end. In addition to this, our offered products are widely used in the industries in order to provide relief to any individual that suffers from sudden flu, collapse, faint, etc. These products are examined under the inspection of quality controllers before delivery to ensure the premium quality. List of Medicines on side of the box & it comes with booklet of First Aid. 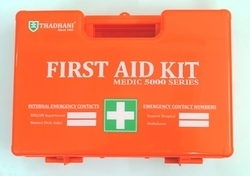 This First Aid Kit is suitable for use in the medium sized workplace to enable employers to meet the Health & Safety standards recommended by government. 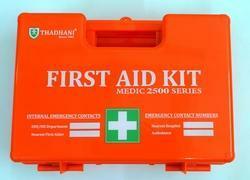 MEDIC® First Aid Kit is Quality Assured at CE 0123 norms, providing total quality control on many of these products. 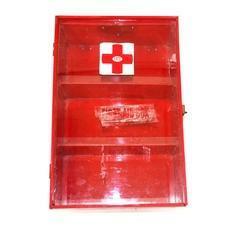 We offer a comprehensive range of First Aid Box, which are specially designed to meet the varied needs of offices, homes, industries etc. Made from high quality material, these boxes and kits are well-known for their light weight, sturdiness, high heat resistivity and durability. We offer these boxes and kits in various sizes to meet the requirements of our clients.